Ulaanbaatar, Mongolia -- In the summer of 2017 the people of Mongolia will regain an important part of their ancient Buddhist heritage. A statue of the historical Buddha designed by Mongolia’s first Jebtsundamba Khutuktu (sacred leader of Mongolian Buddhism) placed within the Uguumur Valley just outside of the Mongolian capital of Ulaanbaatar. In 1924 Mongolia became a victim of occupation followed by a revolution from soviet forces. By 1939 with most all their 1,000 Buddhist monasteries perished along with most of Mongolia’s Buddha statues, only one statue was left remaining. Now with the return of religious freedoms in Mongolia the Grand Maitreya Project is joyously planning to bring back an important piece of the Dharma to Mongolia. The Project will conclude building Phase One with the completion of a 15 ft Buddha statue. This beautiful statue of the Historical Buddha will directly overlook, when completed, the 177 ft. standing Maitreya Bodhisattva statue from the center of heart hill. The Buddha statue has been modeled, engineered and is now ready for full build-up. The Project is currently fundraising with the plan to complete this Historical Buddha statue building work in September of 2017. Phase Two will begin in 2018 and includes the completion of building work for the Maitreya statue, currently over 40% completed. 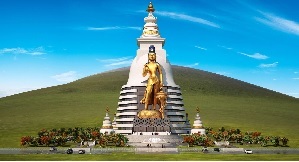 Project spiritual advisors have explained that it is most auspicious and beneficial to complete the Buddha statue before the main Maitreya statue completes. Lamas from the Nechung Monastery in India visited and blessed the statue building site in 2016. Project spiritual Director His Holiness the Dalai Lama and other project spiritual advisers have all provided holy relics and other sacred items to enshrine when the Historical Buddha statue completes. Like the Grand Maitreya Project’s main Maitreya Bodhisattva statue, the Buddha statue is being created in the image of a Zanabazar 17th century statue design. Undur Gegeen Zanabazar (1635 – 1723) was Mongolia’s 1st Jebtsundamba Khutuktu, the most sacred leader of Mongolian Buddhism. Zanabazar was the most influential spiritual leader of the Mongols as he greatly enriched and advanced traditional Mongolian culture through the introduction of Buddhist art, philosophy and culture. In 1640 Zanabazar was recognized by the Panchen Lama and the 5th Dalai Lama as being the reincarnate Tibetan Lama Taranatha, of the Jonangpa line of Tibetan Buddhism. After Zanabazar mastered the skills of the bronze casting while staying in Tibet, he returned to Mongolia to start what would later be called the great Mongolian artistic renaissance. Often referred to as the Michelangelo of Asia, he would become Mongolia’s greatest and most beloved sculptor. Zanabazar created many famous Buddhist master pieces during his lifetime including sculptures of Tara, Amitabha and Buddha. It was Maitreya that Zanabazar had a keen interest in, he created many beautiful Maitreya sculptures while often writing about Maitreya in detail at the same time. The 9th Jebtsundamba Khutuktu visited the Grand Maitreya Project site in 2011 where he made a public speech and blessings for the statue land. Under the spiritual direction of His Holiness the 14th Dalai Lama the Grand Maitreya Project is working to re-build Mongolia's ancient culture and history of Tibetan Buddhism. While at the same time constructing the world’s largest beacon of Loving - Kindness for peace on Earth.The Grand Maitreya Project is a non-profit, non-government organization. The project is being developed with spiritual guidance of HH the 14th Dalai Lama, leader of Mongolian Buddhism HE Khamba Lama Gyabje Choijamts Demberel, Lama Jhado Rinpoche and Venerable Thupten Ngodup.